In the Institute for Nuclear Engineering and Non-destructive Testing on the University of Hannover, investigations were carried out in cooperation with the Laser Zentrum Hannover e.V. (LZH) and the Institute of Material Science (IW) concerning particle transport processes during laser dispersing of predeposited hard particle layers. The aim of the investigations was to analyse the paths, mass flow, velocity and distributions of hard particles inside the molten bath to gain an extended process understanding of the beam/material interactions. Due to the small dimensions (40-120 µm) and high velocities of the particles inside the molten bath (up to 0,2 m/s), microfocus radioscopy was used in combination with a digital high speed camera system. This method enables, for the first time, to observe the mass flow within the molten bath. In this paper, the test and analysis equipment including the image processing system for the observation of particle transport processes will be described. Due to a special digital image processing system the high data flow of image recording rates up to 1000 frames per second could be realised. Some results of the recorded sequences are shown in several examples to give an impression of this application to analyse high speed transport processes during laser dispersing. It is possible to increase the abrasive resistance of wear of surfaces by coating with mechanically resistant material. Additional to conventional methods of coating, the laser gains more and more importance as a coating tool. The laser gives the possibility for exact adjustment of optimal structures of metals by alloying, build-up-welding and dispersing . An interesting method to raise the abrasive resistance of wear of surfaces with laser beam is the dispersing of technical surfaces with mechanically resistant materials or compounds of them. The mechanically resistant material has to be distributed on the smelted surface, but the particles should not be modified. Carbides of the IV, V and VI separate complex of the periodic system are often used for hardening of iron-based materials by dispersing with mechanically resistant materials . There are two different methods to produce hard surfaces by laser beam dispersing: At the single-staged method the powdery particles are transported simultaneously into the melting bath produced by a laser. The double-staged method takes two steps. First the coating powder is placed on the surface (for example by silk screen printing with binding materials). Then it is fused in the second interval. A homogeneous distribution of the particles in the solidification zone is necessary for optimal wear characteristics of surfaces. The particles should not decompose themselves or dissolve . The knowledge of the interaction between laser beam, substrate and the particles during the dispersing is essential for the control of the process. The previous findings are based on simulations  and analysis  of dispersed samples after the treatment. In-situ examinations of the transport of hard particles on laser beam dispersing are unknown. 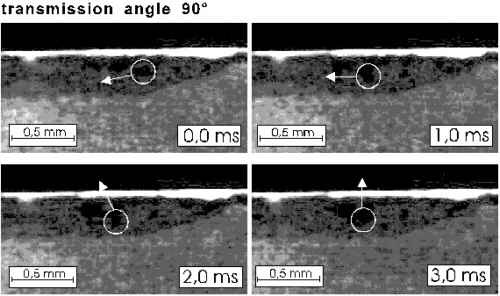 This paper shows the results of transportation of tungsten carbide particles in the melting bath of a titanium based substrate during laser dispersing. The process was observed by use of a high speed radiographic system. In contrast to conventional methods of observing the process, it is possible now to make visible the movement of the particles and to make statements on the processes inside the melting bath. These processes determine the distribution of the particles in the solidified structure and so the characteristic of wear. Besides the material based characteristics, the difference of density of the used particle/substrate combination is a very important criterion. The difference of density influences the contrast of the radiographic tests. Tungsten carbides were used as mechanically resistant particles and titanium based alloys as substrate. The substrate material is marked by an advantageous relation of strength to density. This material is often used in aeronautics, astronautics, and for modification of boundary layers. The density of tungsten carbide (15.7 g/cm³) is about 3.5 times higher than the density of titanium (4.45-4.6 g/cm³). The experiment was carried out by a continuously working Nd:YAG-laser fabricated by NEC. The laser has a maximum output of 1200 W and is controlled by handling facility with a linear axle. A stage index fiber optical waveguide with a diameter of d=1000 µm was used for the control of the beam. The focusing optics consist of a focusing lens (f=116 mm) and a collimation lens (f=70 mm). For the observation of the transport processes during the dispersing an experimental arrangement was used that is shown in figure 1. This arrangement is normally used to find casting defects at light metal casting [6,7]. The existing arrangement was modified and a high speed camera was added. For the radiographic testing of the samples a microfocus X-ray tube, manufactured by Feinfokus, Garbsen; was used. The X-ray tube has a focal spot, depending on the power, with a diameter from 5 µm to 50 µm. This focal spot diameter is very much smaller than the spots of conventional X-ray tubes. The goodness of a X-ray image is influenced by contrast and sharpness. Caused by the almost punctual point of origin of the X-rays, a low geometrical unsharpness according to equation 1 is reached. Equations 1 and 2 shows that the distance b between the radiation source and the object has big influence on the X-ray image . Therefore you have to find a compromise between a small geometrical unsharpness and a sufficient high magnification to archive an optimal image. During the examinations it was possible to reach magnifications up to V = 75, including the internal magnifications of the image converter and camera system. The contrast is influenced by the extinction coefficient µ and the density of the radiographed material. This is valid for a high sensitivity of contrast of the image converter (sensitivity of contrast at difference of grey scale values < 2%) and a negligible factor of dose increase. The quite high extinction coefficient of tungsten carbide and the given difference of density lead to a high contrast of the radiogram. (µ of titanium=1,35 cm-1, tungsten=82,37 cm-1 , carbon=0,5 cm-1). Pictures 3a-3d show that a good detection of the particles is given at a size of approximately 40 µm. The X-rays hit, lessened by the samples, the incoming screen of the image intensifier. The image intensifier changes the X-rays to visible light. The visible radiogram is taken by an optical system to a high speed camera. The recording and analysis of the motion of the particles is mastered by a high speed camera system and the included analysing software, manufactured by Mikromak, Erlangen. During the examinations recording frequencies from 750 to 1000 Hz were reached. The system is able to guaranteed a sufficient expose time at a loss minimum of the process dynamics. The high speed camera data are supplied to a computer-controlled recording system and stored digitally. The image processing system consists of a programmable frame grabber, a high resolution video digitalizer, a frame buffer and an image processor. The frame grabber allows processing of the radiograms by use of different filters and manipulation of the image data (contrast, brilliance, threshold, gray scale value, etc.). This is useful to get a segmentation of significant image contents to extract the interesting information out of the radiograms. In the following there is a description of the image conversion and processing. The image processing system contains scanning, digitalizing, and encoding of the video signal into a grey scale matrix with a scale from 0 (black) to 255 (white), which is applicable to a computer. By the image preprocessing it is meant to modify the images. Within this step the illumination of the images is corrected and contrast and brightness are optimized. One effect of the segmentation is the separation of the observed objects, in this special case the hard particles, from other image contents. Binarisation by setting a grey scale threshold is a simple and effective segmentation method to separate the image contents into object information and background information. Image pixels with a grey scale factor below the threshold are defined to belong to the object and set to grey scale factor 0. They are displayed in black colour. Image pixels with a grey scale factor higher than the threshold are defined to belong to the background of the image and set to grey scale factor 255. They are displayed in white colour. The steps of image processing used in the examinations displayed in figures 3 a to 3d. Figure 3a shows the original X-ray image of a sample spot in 60 °-angle arrangement with the laser induced molten bath and hard particles. The following image (figure 3b) is the result of a contrast and brilliance correction. The setting of a defined treshold leads to the segmentation of the hard particles from the image background (figure 3c). 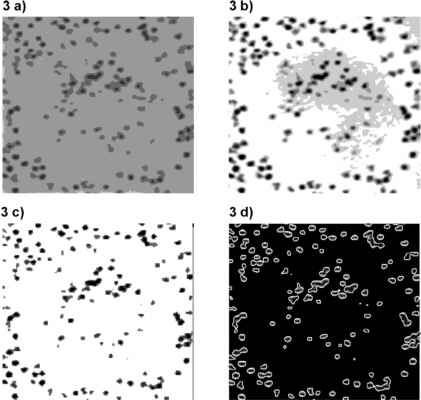 Figure 3d shows a Laplace-filtered image as an example for further possibilities to emphasize the particles. A similar effect is given e.g. by Sobel filtering. Due to the application of the described image processing steps on image sequences up to 1000 images per second, it is possible to determine and to analyse the transport process of several hard particles concerning their location, velocity and acceleration inside the molten bath. The examinations presented in this paper contain dispersing experiments of stationary processes and as well processes with substrate sample movements (forward feed) up to 18 mm/s with steel substrate samples of 2,2 mm thickness for a 60 °-direction (angle between X-ray direction and sample surface), steel samples of 4,4 mm thickness for 90 °-direction (figure 4). This arrangements enable to observe the transport processes of hard particles from the top (60°-direction) and from the side view (90°-direction). The hard particles are placed on the sample surface due to a organic fixing medium. Using a laser-power from 400 to 600 W and a forward feed velocity from 6 to 18 mm/s the molten bath diameter vary from 1 to 2,5 mm. To facilitate the observation of the particles during the dispersing process a relative thin layer of particles was applied. All the dispersing experiments were realized under protected atmosphere conditions (working chamber with argon). The previous investigations of hard particle transport processes during laser beam dispersing have shown, that the high speed microfocus radioscopy system is a usable arrangement to observe and analyse the movements, velocities and accelerations of particles inside the molten bath. That possibility was, until now, not given by conventional techniques of process observation. In the following there will be presented first results which will contribute to understand the complexity of the beam-material-interaction processes. Due to the absorbed photon energy in the moment of the beam admission the particles and the substrate surface warm up very fast. As a consquence of the thermal induced stresses between the relative brittle hard particles, some particles brake apart and, because of the released impulse energy, they are ejected out of the effective beam zone. The next step is the melting open of the substrate surface and, as a matter of this, the capture of the particles inside the liquid phase of the molten bath. On principle the molten bath volume increases with growing beam-action time in which distinctive, flow induced particle transport processes can be observed. There is also an influence of the beam power noticeable. A higher beam power shortens the time interval of the flow building and increases the molten bath dynamics (figure 5). The flow processes are described as Marangoni convections and up to now they were determined by several research centers through numeric simulation works . Due to the power density distribution inside the laser beam (gauss similarity) the highest temperatures are situated in the center of the molten bath whereas the temperature level is decreasing towards the molten bath border. 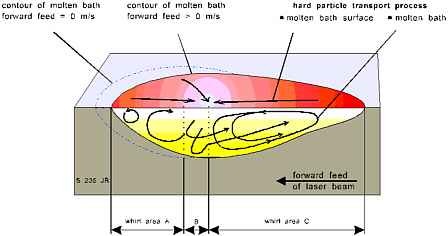 The surface stresses of the melt decrease with higher temperatures and due to an existing surface stress gradient shearing strains on the surface induce the flow inside the molten bath. The principle courses of the flows are shown in figure 6, which shows the flow induced particle movement which could be observed and analysed by image processing of video sequencies . The upper area shows the top view of the molten bath (60°-direction), the lower area shows the result of a side view (90°-direction). The combination of these image data allows a three-dimensional calculation of the hard particle movement in the molten bath (figure 7). The squares visible in figure 5 represent the position of hard particles at the moment of recording. Therefore the time distance between two video records is about 1,3 ms at a record rate of 750 Hz. With these data it is possible to calculate particle velocity. Figure 8 shows the particle movement in the molten bath caused by flow processes. The particles are captured at the contour of the molten bath and transported into the liquid phase. The investigations show that the microfocus high speed radioscopy system is suitable for monitoring the hard particle transport during laser beam dispersing. It is possible to observe and analyse the processes inside the molten bath with the presented test equipment. As a consequence a basis for correlation with the results of a simulation is available. The authors thank the German Research Community (DFG) for their assistance within their investigation project ,,Beam-Material-Interaction During Laser Beam Machining".